It is beautiful, decorative and very tasty...but can pineapple really help with acne breakouts, minimize acne scars and heal bruising left by larger acne cysts? Lets explore this amazing fruit and its many healing qualities. Pineapple acts as an exfoliating agent and unclogs acne pores. Exfoliating naturally speeds up the production of new cells and this is also the same process that rejuvenates the skin. The enzymes found in pineapple fight damage from free radicals and also cleanse the skin by gradually dissolving the whiteheads, blackheads and dead cells on the skins surface. This also unclogs the skin and prevents buildup that invites bacteria, which begins the acne cascade. Bromelain is an enzyme found in pineapple that speeds the healing process by helping the body eliminate metabolic waste from injuries. Acne cysts and larger postulates or pimples, leave behind skin injuries known as acne scars or marks. Bromelain can help them heal faster and rebuild the skin by stimulating collagen production and bonding to the underlying collagen fibers. You can reap the many benefits of pineapple by eating the flesh, drinking the juice or by incorporating a bromelain supplement into your diet, which will provide more standardized benefits for your skin. Vitamin C has numerous healing qualities. Applying vitamin C to the skin may have a beneficial effect due to its antioxidant properties. Correctly formulated vitamin C creams may protect against the aging effects of sunlight and also reduce wrinkles. There is an abundance of vitamin C in fresh pineapple. Its antioxidant activity may help protect your body from free radical damage and also speed up the rebuilding of damaged skin cells from acne marks and scars which lead to visible signs of aging. Try drinking an 8-ounce serving of fresh pineapple juice daily while ALSO using it as a topical treatment. It may work even better! A mask of pineapple puree can be made in a blender and applied to acne scars and marks 3 times a week. Apply the pineapple puree directly to the affected areas and leave it on for 15 minutes. Wash off. The enzyme activity on the skin will help fade acne marks while stimulating collagen production to make acne scars appear less deep and less noticeable. 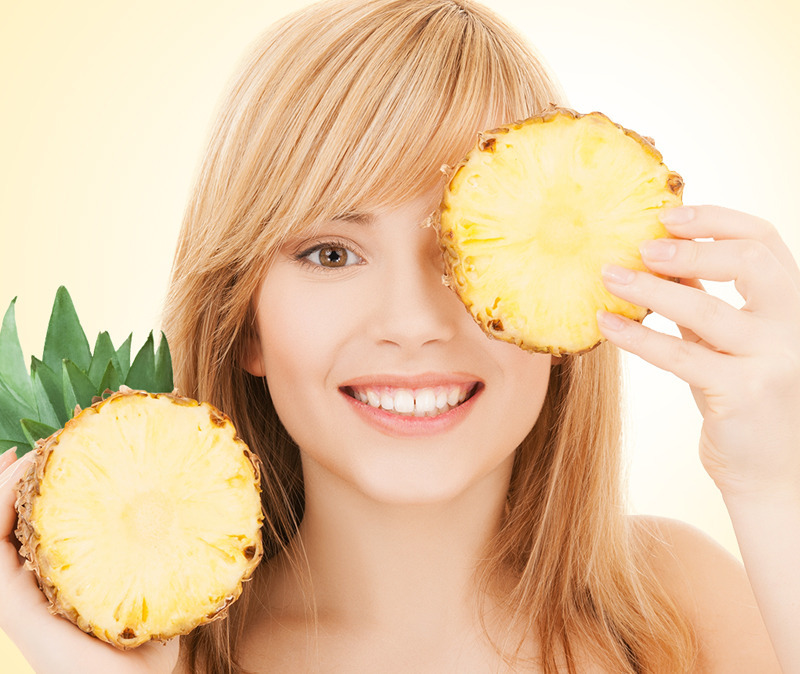 As an added benefit, the ascorbic acid in pineapples will fade current blemishes. Please note: If you feel a burning sensation, wash the pineapple mask off. This occurs because your skin is not accustomed to the enzymes in the pineapple and it may take a few times before your skin is ready for a natural remedy. Wait a few days and try again. Acne marks are more noticeable on bare skin because they appear darker, and are merely a skin color issue. Acne scars are not as obvious unless you look at them directly or have severely deep scarring, and this is a skin texture issue. Acne scars are usually permanent. Topical creams and lotion do little to treat acne scars, so exercise caution when selecting products based on those claims. Acne scars never disappear completely however their appearance can be minimized by invasive facial procedures such as laser or dermabrasion. Silicone micro droplet injections can also help improve the appearance of indented scars. Keep in mind that results vary and even aggressive and expensive scar treatments do not offer guaranteed results. The ONLY real alternative to avoid acne marks and scars is TO PREVENT ACNE. By doing so, you prevent the damage in the first place. 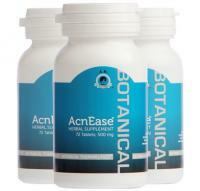 AcnEase® does exactly this by mitigating the impact your hormonal imbalance has on the production of sebum. Hormonal imbalance is the most prevailing reason behind the over-stimulation of the sebaceous glands. This excess sebum, together with dead skin cells and dirt, provides a home for acne bacteria and fertile grounds for inflammation –the begging of the acne cycle. AcnEase® has demonstrated clinical efficacy for treating acne, preventing new acne from forming and making red spots and scars less visible. In addition, AcnEase® improves the quality and health of skin in both males and females, yet another reason it is recommended as an alternative to expensive medical treatments. So tell us what you think in the comments. Is it hard to believe that something found in your kitchen like pineapple can actually have such a strong effect on your acne prone skin? Just remember, we’re not saying that if you try these tips, within a week or so you’ll be free of acne. Use these tips for a while, atleast a few months, in conjunction with a treatment like AcnEase. Then come back and tell us what you think!